The National Institute for Open Schooling serves millions of children every year, and its programs, including the Open Basic Education program should be recognized and supported under the Right to Education Act. Instead, some important programs of NIOS are facing cuts. Like all Academic and Vocational Programmes, the foundation of the OBE programme is based upon openness and flexibility. The registration period is valid for five years thereby not only giving freedom to the learners to choose their subjects but also to study at their own pace. It also provides freedom to select the medium of their choice. A learner has a choice of Hindi, English or any Regional Language as medium of study. Like all academic programmes, OBE programme has no upper age limit for any learner, though children below the age of 6 years are not registered in the programme. Although the RTE Act states that schools cannot deny admission, and aims to enroll every child in school, there are many who are unable to go, who go and find conditions intolerable, or who are, in violation of the law, denied admission. There are also children attending schools that are not legally recognized as schools. There are trusts, co-operatives and other organizations running schools under a variety of circumstances and conditions that are not recognized within the purview of the RTE Act – for example, they may be teaching in a local language, with staff that does not have B.Ed degrees, or teaching in a refugee camp or in a region zoned for displacement and therefore not allotted any schools or other government services. They may be teaching children with different learning styles or abilities in a way that is customized to the special needs and abilities of each learner. After attending such a school a child may appear for the Secondary exam through NIOS, and possibly continue in a mainstream college or other course afterwards. NIOS also offers the Senior Secondary exam. The service is available to all out-of-school learners regardless of reason for not enrolling in school. In 2011- 2012, 2.5 lakh students passed the Secondary (10th standard) and Senior Secondary (12th Standard) NIOS exams. Therefore it is alarming to read, later in the same NIOS Report, that although the institute is doing so well and serving so many across the country, it is being curtailed or discontinued in the name of Right to Education. I quote: “However, in the light of the RTE Act, NIOS will have to discontinue catering to children [up to] 14 years of age after 20132.” In July 2012 the government extended this deadline to March 2015. but the Twelfth Plan (2012-2017) does not mention the Open Basic Education program and focuses on NIOS services for secondary education and vocational training3. The main program serving children up to age 14 is the Open Basic Education (OBE). With the future beyond 2015 looking bleak, many of the OBE study centers have already begun to close, leaving millions of children with no other route towards mainstream education. This is the wrong direction to take. The Open Basic Education program should be strengthened and supported with individual and online registration facilities. In fact, schools can learn from the OBE model, including allowing children to learn at their own pace with no upper age limit. What will happen to the millions of children who depend on the NIOS? At a meeting held in November 2013 at Gujarat Vidyapith, a number of educators from various institutes including Nai Talim Samiti, Azim Premji Univ, Vigyan Ashram and Multiversity’s Taleemnet, endorsed a letter to the Prime Minister calling for strengthening of State Boards of Secondary Education as well as the NIOS. Nyla Coelho of Taleemnet made a similar appeal during the Right to Education session at the India Homeschoolers’ Conference held in March 2014. Homeschooled children in India who need a certificate for admission into any stream of their choice after the tenth standard, have been able to meet this need through the NIOS. While there are private services and international boards, these are expensive and have no commitment to the public, as NIOS does. Homeschoolers who have taken the exams through NIOS have also identified needs for improving the way the examination is administered. For example, recently a child in Maharashtra taking the 10th standard exam through the NIOS was shocked to find that when he asked for additional paper to continue his answers, he was not allowed, as the rules state that only one sheet is to be provided per student. The family has filed a case to change this policy. Perhaps other students suffered because of this unfair rule but did not have the means to file a case; if the rule is changed and students are allowed enough answer sheets to complete all the questions, this will benefit all who take the exam. If the reason that students are allowed only one answer sheet has to do with staffing limitations of the NIOS, then we must advocate for the NIOS get the required budget to hire additional staff and see that students are empowered to do their best. Currently no body has announced or proposed closure of the NIOS, but many parents are worried, after seeing the cuts to the OBE program. Cuts to NIOS would create problems for millions of students who depend on this institute and cannot afford other means as well as those who opt for the NIOS by choice. Even if the RTE is fully implemented and schools are available, people who are affected by displacement, migration, unemployment, sub-minimal wages, ill-health and other issues may not be able to complete 10th standard through the school system and need the option of appearing for the exam through NIOS. Even if they day dawns when people enjoy land rights, sustainable livelihoods, living wages, health security and accessible schools, the NIOS is part of the educational safety net and serves those within as well as outside of the formal school system. Therefore in solidarity with all out-of-school learners, including millions of open learners already registered with the NIOS, and with the hardworking staff of the NIOS, all of us who care about education in India and about keeping educational options open for our children must stand together in support of the National Institute for Open Schooling. We need to urge the Ministry of Human Resource Development to recognize the role of the NIOS and all of its programs including the Open Basic Education program in fulfilling the mission of the Right to Education and to support the multiple paths of learning that children in India are following. We must demand that the NIOS remain open and receive greater support to improve the quality and reach of its services. 1 NIOS, “What is NIOS?” Source: http://oer.nios.ac.in/wiki/index.php/About_NIOS accessed March 2014. 2 From the NIOS 2010-11 Annual Report. The NIOS website states: “The MHRD letter vide no. DO 10-4/2009-EE-4 dated 7th April 2010 has permitted NIOS to continue its OBE programme for 6-14 age group for a period of three years wef 1st April, 2010.” Source: http://www.nios.ac.in/study-centre(aiaviobe)-corner/obe-programme.aspx accessed March 2014. Source: http://planningcommission.gov.in/plans/planrel/12thplan/pdf/12fyp_vol3.pdf accessed March 2014. Below is an overview of my work in 2012 in the following areas: Jivika, Women’s Health, learning, support to AID chapters, projects and publications. Jivika started as an effort to encourage consumer producer links, based on the faith that people were looking for ways to buy products that used fewer resources and supported more livelihoods in the rural areas at living wages. We also sought to develop products that helped people live more sustainably, reducing dependence on disposables, and encouraging lifestyle choices compatible with a greener and more peaceful world. We also wanted to see that half the revenues from sales went to the producers and not more than half went into marketing and shipping the products, so as to reign in the ecological footprint and the income-gap reflected in the overall enterprise. Though it was difficult to meet all the criteria in any given product we kept these guidelines in mind while developing and marketing products. This has limited the range of products that we make, the kinds of materials we use and the ways that we can sell and accept payment. Because we want consumers to be linked with the people involved in bringing the product into their hands, we have not pursued online sales, which would in effect remove the person closest to the point of sale. Typically people see products on the AID website or at a table at an event and volunteers talk to the customer, either via email or in person, before closing the sale. Even in cases where customers contact us by email, volunteers may meet the customer in person. These conversations form part of the outreach of jivika, to increase the amount of time that people spend thinking about where their goods come from and their role in building a sustainable world and examining the power of their purse to impact social and environmental justice. Working with the Srikakulam team we are training tailors and young women learning to sew in making some of the unique products in our line that are also simple for novice tailors to produce. These include baby slings, menstrual pads and cloth bags, where size specifications are not as exacting as they are for ready-to-wear garments. Those who do well will be assigned loose-fitting clothes such as the khadi hoodie or pyzama. At an AID wide level, more of our partner organizations are supplying fair trade goods. We need to develop some criteria for adoption of products. While not all products will meet all criteria, we can expect every product to meet at least, say, three criteria of social and environmental responsibility in order to be marketed via AID. Fair trade: We have been producing and marketing products that help support sustainable living and livelihoods. These include khadi kurtas and other popular garments, nursing kurtas, baby slings, and cloth menstrual pads. “say no to plastic” cloth bags. I have taken these products to the weekly organic farmers’ market in Mumbai. Three large EZ Cookers are in use every week at the organic cafe which is part of the farmers’ market. I continued uploading AID resources on the AID website as well as Twiki and AID Gallery and helped volunteers and chapters access these for various publications. Our 2013 Calendar highlighted the role of bicycles in diverse aspects of sustainable development, including health, environment, transportation, education and livelihoods. I worked with publications team and fundraising team, including Vinod, Rishi, Sai, Shilpa, Naga, Dushyant, Mona and others. We printed 5000 copies of the calendar in the United States and 1000 copies in India. Some of these were used for a physics conference in Pune and others were sent to AID India Chapters for local awareness. 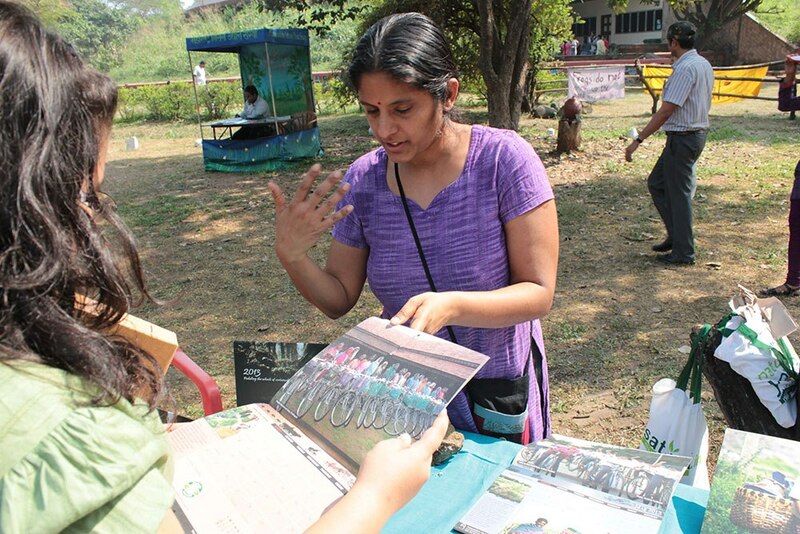 As part of the campaign to bring sustainable agriculture into our every practice, also known as AID Cares, I table at the organic farmers’ market in Mumbai, and raise awareness of the same in local and like-minded circles. Gender Footprint: Following the AID Conference of 2008, I sought a way to connect the micro and macro components of gender bias and violence. This connection becomes all the more urgent when gender issues come to public attention, as they did at the end of 2012. It was vital to ensure that outrage did not reinforce people took the opportunity to introspect and begin changing from within, as well as recognizing violence inherent in social and political structures. The Campaigns team issued a statement and sent the same to the Justice Verma Commission, appointed to issue recommendations to address violence against women and gender justice. Srinadh reminded the group that this could be “a moment to ask questions of ourselves and each other not just authorities.” Reviving the ongoing gender discussions that have ebbed and flowed within AID, the publications team started planning to raise the issue in the newsletter and at an AID wide level. Piya Chatterji reflected the hopes of many volunteers who took part in the discussion in the conclusion of one of her messages: “And I hope that AID might be able to open up forums of discussion around these issues in a more systematic way.” I plan to work on this in the coming years. The work closest to my heart is currently on the periphery of mainstream and even of prominent alternative development programs. My approach has been slow and steady, seeking partners who are involved at the ground level and also sounding out communities that have the potential to be involved and benefit from the kinds of interventions. These involve health and education through what can be termed a natural, community based and continuum approach that connects how we are born to how we nourish the body and mind. In January when I presented birth stories of a few rural women at the Bangalore Birth conference I noted that much of the knowledge that they had gained through non-textual sources was being rediscovered and made available to those who rely on textual sources for learning. In the transfer from the non-literate to the literate, the knowledge had become expensive, affordable to the few and leaving the majority who had sustained that knowledge over generations, now deprived and dependent on inferior systems and services. In February I presented my newfound concept of slow learning at the Learning Societies Conference which took place in the village of Jhadpoli, in Vikramgadh Tehsil in Maharashtra. The session was well received and led to further exploration of this approach to learning. Slow learning recognizes the learning that takes place because something else was not learned. The “something else” typically belongs to a standard roster of learning outcomes, already known and classified according to the knowledge system in the community prevailing around the learner. While not learning this prevailing knowledge, the learner explores other knowledge, with a freedom that depends precisely on the inability of the prevailing community to recognize and classify that knowledge. The learner pursues knowledge as if doing it for the first time in history, regardless of its value or correctness in the prevailing knowledge system. Therefore while typical education programs may have a checklist of learning outcomes that will be used to evaluate the learners, with more checked items indicating more learning and in turn greater success of the program, slow learning looks between and beneath the checked items to the inner curriculum driving the learning of the child. In this sense, the fewer checked items, the more space for this inner curriculum to grow. Slow learning empowers the learner over the learned and honours what is not learned and what is not readily recognized as learning by prevailing knowledge systems. Examples are given in Slow Learning, published on the pages of Swashikshan: Indian Association of Homeschoolers. January 2012 Birth India Conference. I presented on Birth Stories and the advocacy, training and empowerment required to ensure that women have the right to informed and healthy birth experiences. May 2012 AID Conference. Took part in sessions on Projects, Publications, Campaigns and Internships. August 2012 Northeast Unschooling Conference. I presented on Multigenerational Living and Learning, a practice that has until recently been the norm around the world but is threatened by current trends in education and labour. December 2012 – World Breastfeeding Conference. I presented on the topic of Forgotten Foods: Tradition, Nutrition and the Price of Memory. The video is here: “Forgotten Foods” presentation at World Breastfeeding Conference Delhi. Along with Ravi I visited San Francisco Bay Area, Baltimore, Maryland, Boston, Albany, Amherst and other chapters. We worked with volunteers and spoke with community supporters to help explain the way AID works, what makes the work effective, and how they could participate in supporting the work. In Boston, Seattle and Maryland the chapter also hosted a fundraising dinner where we spoke with community supporters. In Seattle along with Sunitha and Murthy and Madhavi we met with some local members of the community to seek donations. We got some thoughtful suggestions and feedback on our awareness materials. I welcome Anupam Ahuja’s vision of “acknowledging, respecting and celebrating diversity as enriching humanity and a normal aspect of society.” This will facilitate efforts to include people who are differently-abled, and in fact we should be doing this already, for everyone. Why do we discount the diversity within all of us, label some of as “standard,” and call those who do not fit into that standard as disabled and thereby uniquely able to bring about the promised enrichment of humanity? If we truly respected the diversity within each one of us, our society would be a more hospitable place for those with conditions that are normally labelled disabilities including impairment of hearing, vision, motor-functions and more severe conditions. Currently home-education is a route that anyone in India may pursue, and one not need demonstrate any specific ability or disability to avail this path of learning. Secondly, I would urge you to question the value of labeling children as disabled – I understand that it is used to help children access appropriate services, but there is a risk associated with labeling as well, a risk that one sees the disability and is blinded to the abilities of each individual, and also that any departure from the increasingly rigidly defined “normal” is labelled a disability. We are seeing this with the rise in learning disabilities that are being diagnosed in Western countries and also in India. Many people have observed that children allowed to learn at their own pace and following their own, at times roundabout paths will learn more meaningfully. Some schools allow for such learning, but increasingly the pressure of standardized curriculum and testing makes this all but impossible. Compound that with earlier start of formal education (who waits till age 6 now? the admissions race begins far earlier.) and the child who is engrossed in thinking or exploring interests other than reading, writing and arithmetic is not allowed to do so, but labelled slow or disabled, or having attention deficit, or defiance disorder. Instead can we not recognize that child as learning? When school systems embrace every child’s right to learn, then they will not depend on confining children for many hours each day within fixed spaces and fixed ideas. My sister went to school with a disabled child. In her classroom, children had “jobs” every day, such as changing the calendar page, arranging supplies, erasing the chalkboards, cleaning the table after lunch, etc. One of the jobs was helper for the disabled child, Kumar (name changed). The jobs rotated so that every week or month every child got to do every job at least once. My sister tells me that everyone looked forward to being Kumar’s helper. There was no condescension, and Kumar also got to do certain jobs and be helpful. Schools that equip children to accommodate difference, whether in ideas, habits, or physical ability, will ultimately serve all students. We are a long way from that today however. To achieve that vision in our schools would require changes in our society. It would require that we sincerely live up to our constitution and believe in every person, respect rights of everyone without exception. We should foster connections between formal and informal paths of learning, not posit one as a threat to the other. Those working in home-education and those working in school-education, and who believe in a society that works “for all the children including Mira,” serve in complementary roles to articulate and achieve this vision. So what makes education in a democracy distinct? So what makes education in a democracy distinct? And I would argue that what makes education in a democracy distinct is that we don’t educate for obedience and conformity; we educate for initiative and courage. We educate for imagination and hope and possibility. And we recognize that the full development of each person requires the full development of all people. Or another way of saying it is, the full development of all is the condition whereby we can educate each. And that shifting of the frame is so important. And frankly, I’m hopeful that in this period of rising expectations, of rethinking so much, that this is where we can go.